This is my new favourite dinner – it is the reason I am going to plant 200 – yes 200 – sweetcorn plants next year. (If you say it on your blog it has to happen – the fact I don’t know where I am going to put these plants is completely and utterly beside the point, I have months to figure this out!). The recipe is inspired by one by Thomasina Miers but is made using my version of Thai green curry paste (and missing out all sorts of other ingredients) that is loosely based on one by Delia Smith. You can tell I am an academic as although basically the recipe is mine I have to cite all my sources! Anyway moving on …..
Curry paste – all the quantities for the paste are sort of flexible, mine changes each time I make it, I like this, probably because I have to as I am too lazy/busy to standardise it – lemon grass (fresh or from a jar) let’s say two big stalks or so, or three or four tsp from a jar; grated ginger – about 3 tsp, maybe 4 (or couple of tsp of galangal); 3 chillis – cut out some of the seeds, I leave some in because I am lazy; big handful or 2 of coriander; 2tsp of coriander seeds and 2tsp cumin seeds; zest and juice of two limes; couple of cloves of garlic. Toast the seeds and then grind in a pestle and mortar. Put everything in a food processor and whiz to a paste. Use what you want now and then freeze the rest. I usually use a couple (maybe 3tbs) for a curry. Curry: couple of tbs of curry paste; tin of coconut milk; couple of tbs of Kechap Manis; juice of a lime or lemon; some fresh coriander if you have some; little bit of Thai shrimp paste and big splash (or pour) of fish sauce (if you don’t want it to be vegan – if you want it to be vegan just add in some soy sauce instead – the version in the photo above was vegan); fresh corn on the cob – maybe 3 cobs for 2 people – really can you have too much fresh corn though? 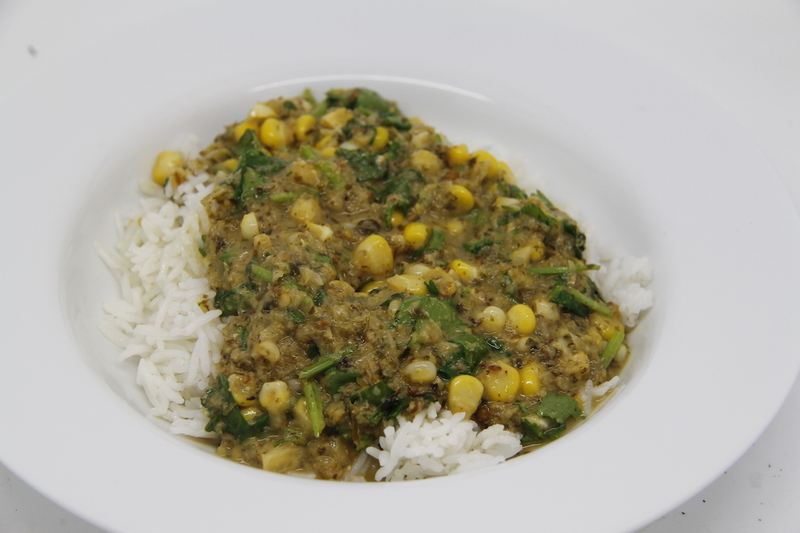 Put everything except the corn in a saucepan and bring to a gentle simmer. 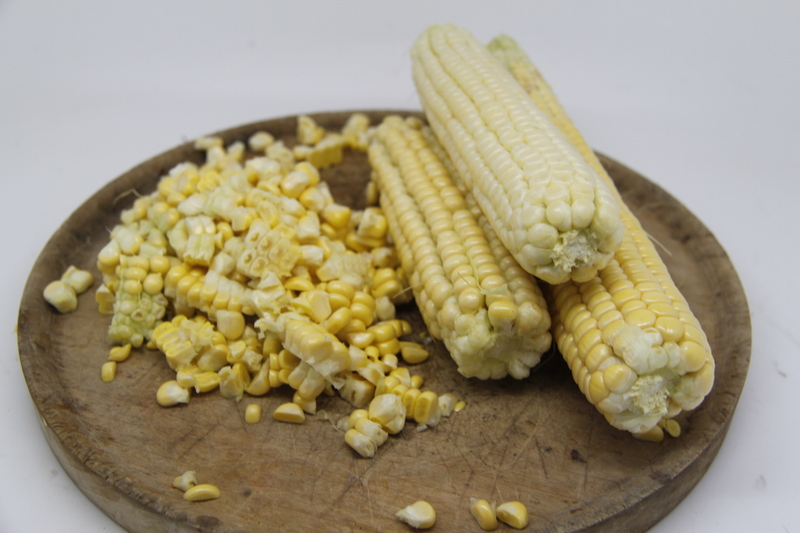 Cut the corn off the cob, add and simmer until cooked – 5- 10 minutes. Whizz a few ladlefuls in a liquidiser and then add back – you don’t have to do this, but it makes the texture a bit more interesting I think – this is code for less watery. I sometimes add Thai basil as well, if I have it. Serve with rice. You could add tofu to this, that would be lovely. I have also made it with courgette, but of course …..
N.B. Did I mention how quick this is to make. It is so easy I can make it when I get home from work at 9pm without getting stressed.